You’ve been in the car or the plane for hours, your back is aching and your legs are stiff and sore; you can’t wait to stand up and get moving again. We’ve all been there. 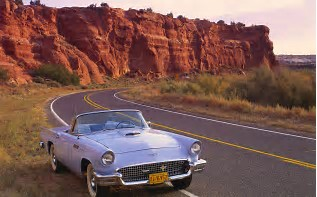 This summer, plan for a pain-free travel experience by making small changes that can make a big difference in how you feel once your reach your destination, advises the American Chiropractic Association (ACA). Walk before and after a long trip to stretch leg muscles. Adjust the seat so you are as close to the steering wheel as comfortably possible. Progress through a series of muscle stretches when driving: open your toes as wide as you can, and count to 10. Count to five while you tighten your calf muscles, then your thigh muscles, then your gluteal muscles. Roll your shoulders forward and back. Always make sure to put safety first and keep your hands on the steering wheel and your eyes on the road. Instead of constantly gripping the steering wheel, alternate tightening and loosening your grip occasionally to improve hand circulation and decrease muscle fatigue in arms, wrists and hands. Take rest breaks to move around and refresh yourself. Never underestimate the potential consequences of fatigue to yourself, your passengers and other drivers. 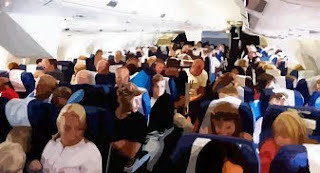 Crowded airplanes make exercise more challenging. Stretch at your seat or get up and walk down the aisle. Stand up straight and feel the normal "S" curve of your spine. To prevent back pain, use rolled-up pillows or blankets to maintain that curve when you sit in your seat. Check all bags heavier than 5 to 10 percent of your body weight. Avoid overhead lifting of any significant amount of weight to reduce the risk of pain in the lower back or neck. When pushing your belongings under the seat, do not force the object with an awkward motion using your legs, feet or arms. This may cause muscle strain or spasms in the upper thighs and lower back muscles. Information courtesy of Dr. Scott Bautch and American Chiropractic Association ACA's website.